After dinner out at a Korean restaurant with my husband and his friends, we stopped at a carry-out for some wine. Getting back into blogging was my excuse for perusing the candy shelves, and I just couldn't resist trying Boyer cups again. Maybe I should start saving the play money! 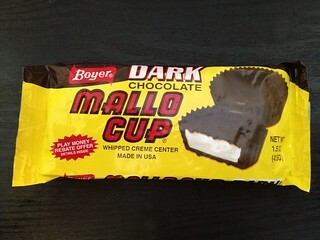 Boyer is known for Mallo Cups, but I'm not sure I've ever had one. I had never evem seen the dark chocolate variety, but since milk chocolate and marshmallow sounded a bit too sweet, dark seemed like the best choice. The packaging itself was eye-catching, and it reminded me a bit of a comic book. The cups had a strong cocoa scent. My first bite was surprising because I was not expecting coconut! It's on the ingredient list, of course, but it's not mentioned anywhere on the front of the package. The coconut added a little texture to the cup, but coconut haters, be forewarned! The dark chocolate itself wasn't great. 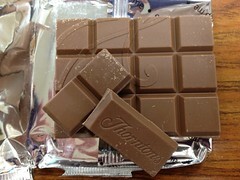 It was firm, but tasted a little powdery, especially in areas where the chocolate was a bit thicker. The marshmallow filling was pretty tasty. It had a light vanilla flavor, and the dark chocolate helped keep it from seeming too sweet. When the chocolate, marshmallow, and coconut were all in the right balance, it was pretty good. When picking up almond meal to make French macarons, I picked up these all natural almond butter cups on a whim. Peanut butter cups are one of my favorite treats, so almond butter cups seemed like a sure thing. SunSpire makes all natural chocolates, and they have some gluten free, dairy free, and fair trade certified products, too. These cups weren't fair trade, though. The pack comes with three cups, molded into their inner packaging. As you can see, the cups were really hard to get out of their packaging. The almond butter was extremely dry and crumbly, so much so that these cups fell apart while I was eating them. Despite causing so much trouble, there was hardly any almond butter to speak of; these cups were mostly chocolate, as shown in the picture below. Compositional problems aside, these really weren't bad. They didn't have a strong scent at all, just a bit nutty. The chocolate was bitter and creamy, and since it was so thick, it overwhelmed the very mild flavor of the almond butter. The almond butter was quite smooth and consistent, but I could barely taste it. The ratio of chocolate to almond butter was just way off. I've had all-natural products with much better consistency than these, so I don't think I'm being unfair in saying that these just missed the mark of what a nut butter cup should be. 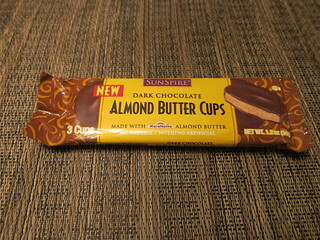 I'll have to try some SunSpire chocolate on its own, because that part was pretty good. 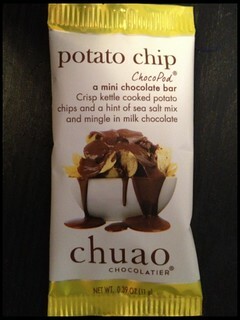 It's been a long time since I've had a Chuao ChocoPod, so it was a pleasant surprise to find one in my November Birchbox. It's a paid subscription service that ships a box of high-end beauty samples each month, and occasionally, there are edible extras. Prior to this, all I've gotten were nutrition bars, which were nowhere near as tasty as fancy chocolate. Chuao seems to be one of the more adventurous chocolate companies out there, at least among the brands that are readily available in stores. Furthermore, I have yet to meet a Chuao bar that I don't like. The streak continues! 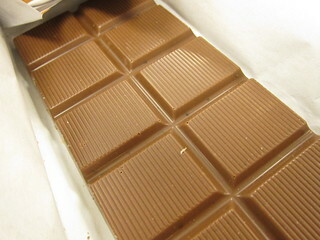 The ChocoPod had a strong cocoa scent, which is always encouraging for a milk chocolate bar. The chocolate was buttery, and not too sweet (nor was it very sticky). After the initial mild sweetness of the chocolate, the saltiness kicked in. The saltiness of the kettle chip bits was enhanced ever so slightly by a bit of sea salt, and overall, the salt level was good. It enhanced the buttery qualities of the chocolate, and with the faint potato flavor from the chips, I was almost reminded of mashed potatoes (in a good, chocolatey way). Finally, the chip bits were very crunchy, breaking up the smooth texture of the chocolate quite well. On the last day of our annual Las Vegas trip, my husband and I went to a cute little restaurant called Island Style for some Hawaiian/Korean brunch. After some tasty Loco Moco (and great service, I might add), we had some time to kill, so we walked over to a nearby CVS drugstore. While traveling, I love checking out grocery stores and drugstores for local releases, and one such product in this Las Vegas CVS was Salsa Verde Doritos (and some Chile Limon Lays that got consumed on the plane home). These aren't available in the Midwest, so I'm guessing they're limited to the Southwest. There were many more curiosities at this particular CVS, including slot machines, video poker, and a full liquor store, but that's Las Vegas for you. The chips smelled a little like lime. Right away, I could taste tart lime, along with cilantro, then onion and garlic. Finally, there was a bit of jalapeno heat at the end. All in all, these Doritos did taste like salsa. 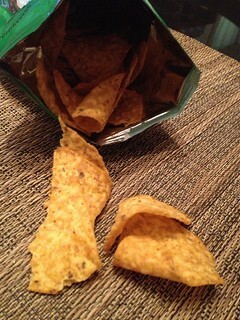 The best part about the Salsa Verde Doritos was the slow-building heat. After a couple chips, my mouth was a little warm! It never got too spicy, but these were certainly spicier than most varieties of Doritos. I hope these make their way to my neck of the woods in the future! The Doritos website has a neat little search feature that you can use to check if a certain product is available in your area. 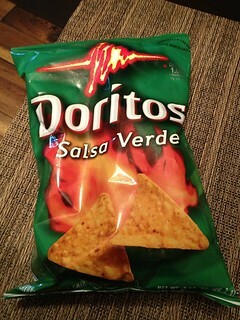 Sadly, no Salsa Verde Doritos are sold within 50 miles of my zip code. Bear with me readers, because this is kind of a weird one. 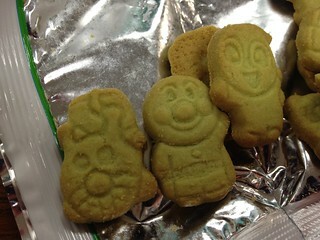 These Anpanman (red bean paste filled bread man) cookies are made with spinach and banana. 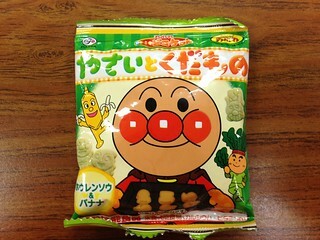 Even though there were vegetable characters on the bag, I can't help but wonder if, like other sneakily healthful foods, the idea is that kids are supposed to gobble them up without thinking about the vegetables inside. Either way, these cookies were passed on to me through two different friends whose kids didn't like them, so I don't think it's working. Truthfully, I was supposed to give them to my nephew, but I figured he wouldn't like them, either, and I couldn't resist having a taste. My nephew is a big fan of real vegetables, so I didn't feel too guilty about keeping them. There was also a bag of carrot cookies that I didn't photograph. Although carrot seemed like a safer bet, those actually tasted worse. The cookies smelled like grass and vanilla. They tasted very faintly of banana, and the flavor seemed a bit fake to me. While they were sweet, there was something weird about them. The cookies tasted sour like chewable vitamins, but not in a good way. The cookies were crunchy, but like vitamins, they had a chalky texture. The banana killed some of the sourness, but let's face it: even kids don't like these. At least they were better than the carrot cookies. 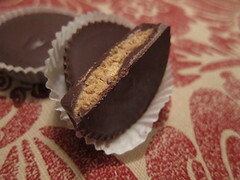 As a peanut butter lover, I'm always on the lookout for different types of peanut butter cups. Although the Boyer brand is new to me, the wrapper had the look of an old-timey candy, right down to the play money "rebate" offer. I'm not it's worth it to buy 50 packs of cups just for a $1 rebate, not to mention the postage to mail 50 cardboard pieces of play money is probably close to $1 itself, but I got a chuckle from it. I said the Boyer brand was new to me, but that's just because I had no idea Boyer made the more famous Mallo Cup until going to their website for this review. Boyer has been around since the Great Depression. Though the brand has been sold a few times since then, the nostalgic look of the packaging hasn't changed much. 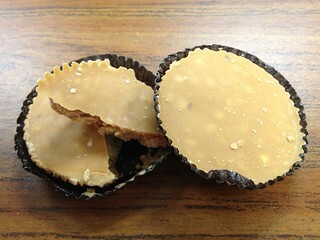 The cups had a lumpy look to them, offering a preview of the small nut pieces I would find inside. The coating was sweet and creamy, the nutty center was dense, and I liked the slight crunch from the small peanut chunks. 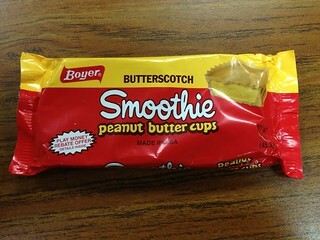 I didn't notice that these were butterscotch peanut butter cups until I tasted them. The butterscotch was a bit too sweet, but the warm, buttery flavor went well with the peanut butter. 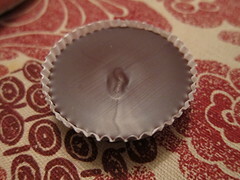 The cups were salty on the finish, and while they were different from the usual peanut butter cup, I found them too sweet to want to eat often. Here's a curious little confection that my boss brought back from England on her last visit. 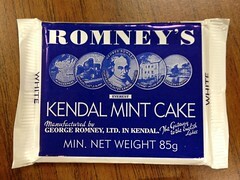 Traditionally, Kendal Mint Cake is intended for mountain climbers as a source of energy, and all it contains is sugar, glucose, water, and peppermint oil. The two varieties here are made with white sugar and brown sugar, but there is also a chocolate-covered version. Both pack a seriously minty aroma, and pieces break apart like fudge. 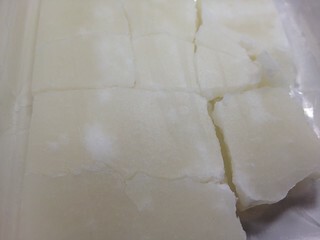 The white sugar version, found in the blue package, had the slightly crunchy texture of fudge. 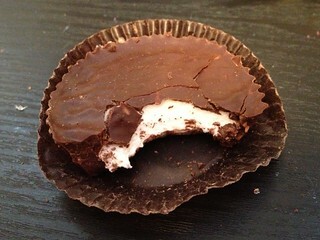 It reminded me of the center of a peppermint patty (so it would probably be quite nice if coated in chocolate). The mint was cool and refreshing, but not too strong. Of course it was sweet, but there wasn't really much flavor to it. I suppose flavor isn't the biggest concern for mountaineers. I much preferred the brown sugar version, simply for the added hint of molasses that brown sugar imparted. The mint was stronger in this version as well. 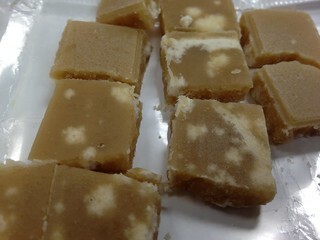 The texture was a little firmer than that of the white, but still very much like fudge. 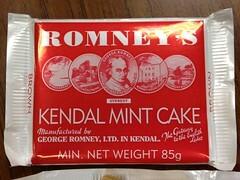 These mint cakes reminded me of the molded maple sugar candies found in areas known for maple syrup. While the peppermint oil was nice and refreshing, eating a piece of mint cake resulted in an immediate urge to go brush my teeth. The experience was interesting, but I think I'll leave this one for the mountaineers. 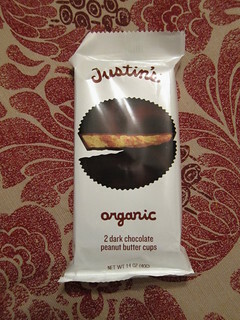 This pack of Justin's Dark Chocolate Peanut Butter Cups was an impulse buy at my local fancy grocer. It wasn't the fact that these are organic that won me over - it was the fact that they are dairy free! I'm willing to put up with the side effects of lactose intolerance for chocolate, but it's nice when I don't have to! The wrapper isn't too exciting, but it gets the job done. I'll admit to succumbing to the charms of a flashy wrapper, but this is one of those times when the product just speaks for itself. Even though I had a great experience with these, I must mention that a fellow blogger and Flickr contact had a pack of these that was extremely dry and crumbly. There are two pictures of the cups because I thought they were just beautiful. 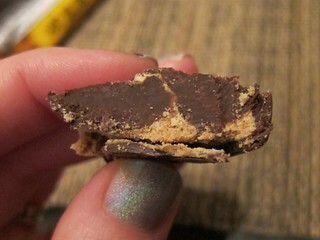 The dark chocolate was glossy and I loved the unevenness of the cross-section. The cups smelled dark and distinctly nutty. The dark chocolate had a good snap and a smooth, even melt. The peanut butter filling was subtly-flavored and soft. It had the right amount of saltiness, and just a hint of sweetness. 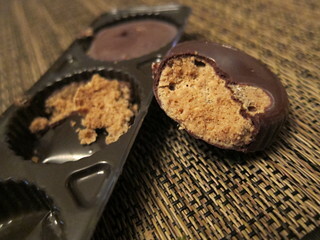 The balance was great overall, and the texture was smooth, without that oiliness that other peanut butter cups can have. Very good, and did I mention they're dairy free? Even though I've been away from the blog for a while, I was really tempted to come out of hiatus just to post a review of the incredible "Adult Sweetness" Matcha KitKat. 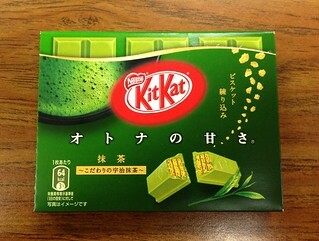 It's everything I love about matcha and KitKats, and I highly recommend you try it if you like green tea. This summer, I went on a business trip to northern Ontario, Canada, and got stuck there over a holiday weekend. I took a day trip to Toronto with the sole purpose of buying snacks, and I was not disappointed, because I found this KitKat. 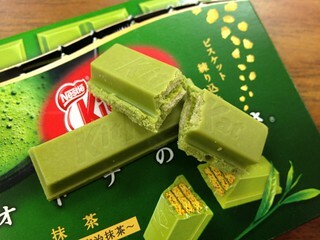 This KitKat had a strong matcha scent and a gorgeous green color. The flavor was spot-on: nice and bitter and just a little grassy. The "Adult Sweet" (meaning not very sweet at all) white chocolate added just a hint of milkiness, like a strong matcha latte. Perfect for a matcha enthusiast! The matcha chocolate was creamy and just a little grainy, which went well with the delicate wafers. The wafers also seemed finely milled in comparison to a normal KitKat. I bought 5 boxes and a bag of mini bars, but it wasn't enough. I miss this KitKat so much. Japanese Snack Reviews reviewed them too, if you'd like an opinion from a less matcha-addled mind. 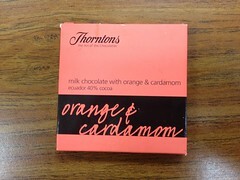 This review is a long-overdue continuation of another review of Thorntons chocolates from my boss. Thankfully, I took good notes when I ate them, and these were so good that they stick out in my memory. 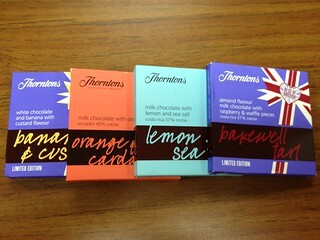 The remaining bars are Orange & Cardamom and Banana & Custard. 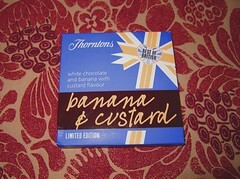 Thorntons is a brand that I desperately wish I could find in the United States. As it is, I am grateful for the kindness of my boss, who often brings back sweets to share when she visits her family in the United Kingdom. 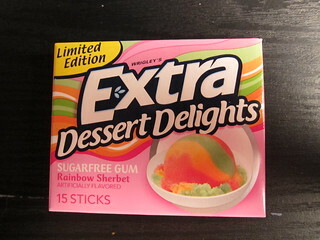 Even though they are all interesting, I have yet to really love any flavors from Extra's line of Dessert Delights. I adore how they approach Willy Wonka territory, but like Mr. Wonka himself, there's always something that just seems a little bit off. Rainbow Sherbet actually didn't have that odd note, and I really wanted to like it. The bright pink packaging is gorgeous, and I've always loved rainbow sherbet (especially when mixed with cream soda, Sprite, or ginger ale). The gum smelled tart and very fruity, but in a nondescript way. While chewing, I could taste lime and raspberry, but mostly, it was just a little sour. 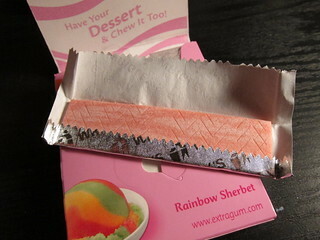 The gum didn't have much orange to it, but maybe that would have overpowered the other flavors. It did indeed taste like rainbow sherbet. This gum might set a new record for short-lived flavor; I got around 2 minutes. The chew was firm and not very bouncy, and the gum itself was a bit dense. Though I enjoyed the flavor, I tend to just gnaw through entire packs of gum when the flavor dies out so quickly, so my jaw would thank me not to buy this gum again. My older brother is a cherry enthusiast. Every Christmas, he could count on finding a box of chocolate covered cherries under the Christmas tree with his name on it. You know, the kind with the sticky, syrupy filling, and the remnants of what was once a cherry in the center?1 These Chukar Cherries are nothing like those. 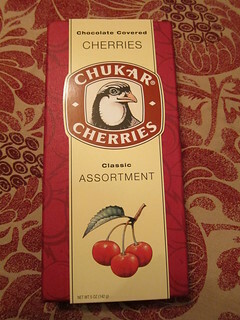 Appropriately, it was my brother who sent me this box of Chukar Cherries. I feel like I've missed out on so much in life by avoiding chocolate covered fruit, and it was all due to my own misconceptions. These were plump, meaty cherries with intense flavor, covered in lovely, thick chocolate. Here's a little bit about each kind in the box I received. In the Cabernet Cherry, I didn't really taste the wine, but the tart cherry was wonderful. It was sour at first, but it had a nice bitter flavor. The outside chocolate was thick and only mildly bitter. My husband described this one as fresh. Classic Cherry had a very sweet and sticky chocolate coating. The cherry within was mild and tender, and sour on the finish. The chocolate reminded me of hot cocoa, but while tasty, this wasn't my favorite of the bunch. The Black Forest Cherry had a gorgeous dusting of bitter chocolate, and it did taste like black forest cake. The bittersweet cocoa was just right, and the cherry was woodsy with a slightly sour finish. The balance of bitter and sweet was perfect, and this was my favorite of the bunch. Truffle Cherry was enrobed in sweet and smooth chocolate, with a very sweet, mild cherry center. Like the Classic Cherry, it was by no means bad, just not my favorite. The Amaretto Rainiers were very sweet with an odd, medicinal note ar the start (probably from the liquor). The cherries were the plumpest of the bunch, but a little overly sweet. Cherry Rouge had a strong cherry flavor, though my husband thought it was reminiscent of strawberries. These were nice and tart, but I didn't love the extra cherry flavor. 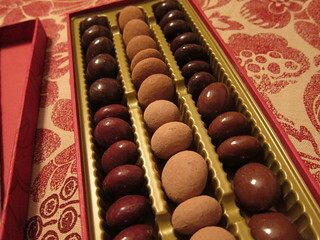 On the whole, I loved the thick chocolate, and the dried cherries in the center were wonderful. It seems a shame to call them dried cherries, because they were so plump and tender! The dark chocolate-covered varieties were definitely my favorites. Chukar Cherries are a Washington specialty, but they are easy to order online. 1 I have heard that some people, for example my brother and my husband, do like cherry cordials. Let's skip the part where I explain why I haven't blogged in so long. If anyone is still reading, I'm sorry for my absence! Please accept my sincere apology, and my gratitude. My chocolate and candy consumption certainly hasn't slowed down, and I went over my dental insurance limit for the year, so I may as well blog about it! Butlers is an Irish brand of chocolate, but my local superstores carry a decent selection of bars. 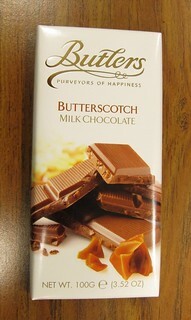 For such a comforting, homey flavor, I haven't seen many butterscotch chocolate bars in stores, so this Butlers bar stood out. The milk chocolate was embedded with tiny, toffee-like pieces of butterscotch, and it smelled just a little toasty (in a good way). The butterscotch pieces were first crunchy, then chewy, and they were surprisingly flavorful. I could taste buttery nuttiness and hints of burnt sugar. 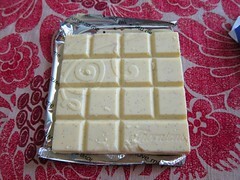 The milk chocolate had a good consistency, despite being a little sticky. It had a moderate cocoa flavor that played nicely with the buttery pieces. 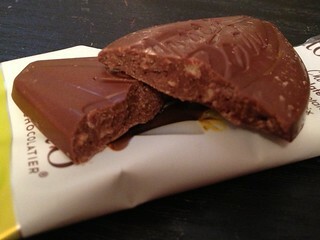 The bar was a bit too thick, but I did appreciate that it was firm and had a decent snap for milk chocolate. The finish was a little too sweet for me, but on the whole, I was pleased.